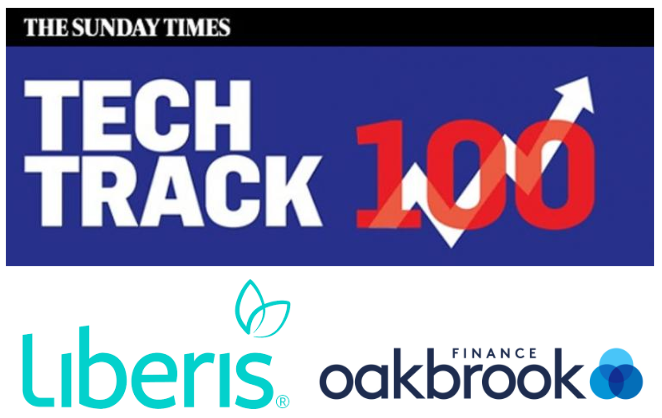 Congratulations to the teams at Oakbrook Finance and Liberis! We’re so proud to see them ranked 16th and 83rd position respectively in the fastest growing Tech companies list published by The Sunday Times Hiscox Tech Track 100. The table ranks privately-owned tech companies by fastest-growing sales over the past three years, so it’s great news to see them both included. Started in 2011, Oakbrook Finance makes lending more accessible to those who are otherwise unable to access traditional loans: reducing the necessity for payday lenders and other more expensive alternatives. Likely Loans, their main product, offers a range of loan options – even for those without a guarantor or with bad credit history. These range from small, immediate loans to more larger loans with longer-term repayment plans. Since it began, more than 100,000 people have already taken out a Likely Loan and they’ve received an incredible 99% customer satisfaction rate. Well done to CEO Michael Woodburn and the rest of his team for their hard work! Liberis, which began in 2007, helps small businesses obtain funding with their Business Cash Advance product. This is based on future credit and debit card sales – customers end up paying back your company’s advance as repayments. By linking repayments with your company’s cash flow, Liberis are able to offer one fixed price without any add-ons. The company operates on three core principles – a simple product, responsibly delivered, by specialists who understand their customers. Liberis has so far managed to help 5,000 small UK businesses obtain around £170 million of funding. Congrats to Rob Straathof and his colleagues at Liberis, it’s wonderful for their success to be recognised by The Sunday Times. We’re very pleased to be helping both of these exciting ventures grow – providing much-needed financial help to businesses and individuals alike – and we’re looking forward to seeing what the future holds.